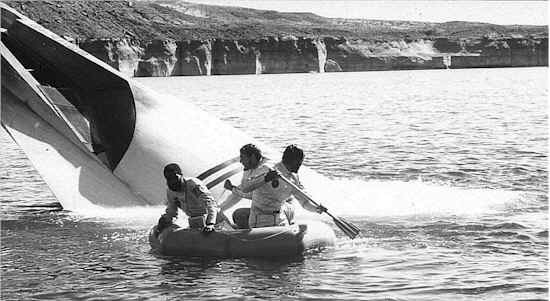 Of all the crew aboard Taylor's mission, Dodge acts the least affected by the crash and their fate. Why is that? Q: Of all the crew aboard Taylor's mission, Dodge acts the least affected by the crash and their fate. Why is that? A: I firmly believe that Dodge is not a military person or officer, rather that he is a civilian who was honored to be aboard the first interstellar flight. Dodge was probably hand picked for some reason, to be aboard the flight. In order to get aboard a flight like this one, Dodge's credentials must be impressive which would mean that he was considered to be a valuable member of a very serious scientific undertaking by both the United States and ANSA. After the crash, Taylor and Landon start into bitter bickering while Dodge simply goes off and does his own thing, taking neither side. When something interesting strikes his curiosity, he interjects himself into the conversation, but otherwise, he feels that the military has gotten him to his destination, and if it were up to him, he would dispense with Taylor and Landon and go on his own way. He is the one who has the duty to study and read the atmosphere, indicating that he has a very scientific background. This is only further proven when Dodge does all of the soil sample experiments after they pull their life raft onto dry land. Notice that Dodge is also the first out of the spacecraft, and when it comes to the task of rowing away from the ship, it is Taylor and Landon, the military men, who row while the civilian, their charge, merely lays forward in the raft and takes in all of the scenery. Dodge's attitude is more inline with a civilian than a military officer, he only starts to act as part of the team once he's in a position to do so, such as when they make it ashore and it comes time to test soil samples or when Taylor orders him to read the atmosphere. He also seems to have more ability to buck command with Taylor than Landon does. This argument would seem to be put to final rest in the third movie when a government inquiry board asks for information on "Lieutenant Dodge", thus conferring some amount of military rank to his position. Is he a civilian or a military officer? The argument can go both ways and we may never know for sure. The military officers row their civilian charge to safety as the ship sinks.